Winchester Cathedral can be found in the Square. From the Butter Cross in the High Street go through the passage into the Square, have a cup of coffee in one of the alfresco cafe's, then walk on to the Cathedral Green. Probably the best known image of the city. Beautiful and iconic. A melody of architecture, yet foursquare and significant. Dedicated to The Holy Trinity, St Peter, St Paul and St Swithun, quite a combination. The cathedral is the longest medieval one in Europe. Admire the magnificent soaring great screen behind the main altar, it is truly beautiful. The mighty organ sings out for services and has done for 150 years. Those choir stalls have been there since the 1300's and those lovely medieval tiles at the far end of the cathedral you are walking on have been walked on since the 1200's! Several tours are available and the first two listed here are part of the admission price. You will be taken around by a knowledgeable guide and you can ask questions if you wish. Makes it more enjoyable when people do so and most of the guides like it. Of course people who deliberately ask questions designed to annoy the guides are not liked by the crowd either! If you have done the tour before it is not a bad idea to do it again as different guides have their own natural approach and it can be a different experience. So much to see. That magnificent soaring screen with all its detailed carvings that has fascinated me from a young child, the many other carvings, statues, the chapels, tombs of famous people, memorials, military banners and above all the fine construction wrought by those ancient builders. There is the main Cathedral Tour. Runs Mondays to Saturdays on the hour from 10.00am – 3.00pm. There are many characters in the history of the cathedral, some good, some not so!! Human nature does not change! This wonderful place has been part of the history of England from Saxon times, feel it in the stones! Being so old there are many treasures from over the years in this intriguing place. The Crypt Tour runs on Mondays to Saturdays at 10.30am, 12.30pm and 2.30pm. It is quite fascinating and quite stunning, but the crypt can still flood. If they do the tours cannot take place, but you do not miss out entirely, there is a viewing platform. There is apparently a Holy well down there. Holy Wells are sacred springs and it is not suprising that one is here, given that the site of the cathedral goes back a long way and the crypt is its oldest part. This well probably pre dates the cathedral by some time. Such wells can be found all over Wessex. Ask about the famous diver, William Walker! He saved the cathedral from destruction. Quite a feat! 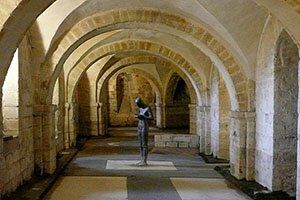 Antony Gormley who is responsible for the “Angel of the North” sculpture, also created the “Sound II” sculpture in 1986 which can be seen in the crypt. A crypt is basically a cellar, although a special type! These underground chambers are found under churches and burial grounds often to inter the dead. Some large houses in England have their own crypt or family vault for the burial of family members. The Tour of the Tower is not included in the admission price and costs £6 and the ticket is available from the entrance desk. Not for the under 12's though, or the claustrophobic and those with vertigo problems! Tours take place on Mondays, Wednesdays and Fridays at 2.15pm. Then there are two on Saturdays at 11.30am and 2.15pm but only from June to August. Remember - it is 213 steps to the top!!! When you get there the view is magnificent. The ascent is up a very narrow spiral staircase! If you are claustrophobic – don't try! Wonder at those big beams felled many centuries ago. It is also an opportunity to see the big old cathedral bells and the ringing chamber. There is also an Audio Tour Price £3 from the entrance desk. Your guide in this case is David Suchet, recognisable as the detective Hercule Poirot in the TV series. A nice idea if you want to tour the cathedral on your own. Takes around an hour to hour and half depending on how often you stop to look. The cathedral choir on the sound track adds to the atmosphere. 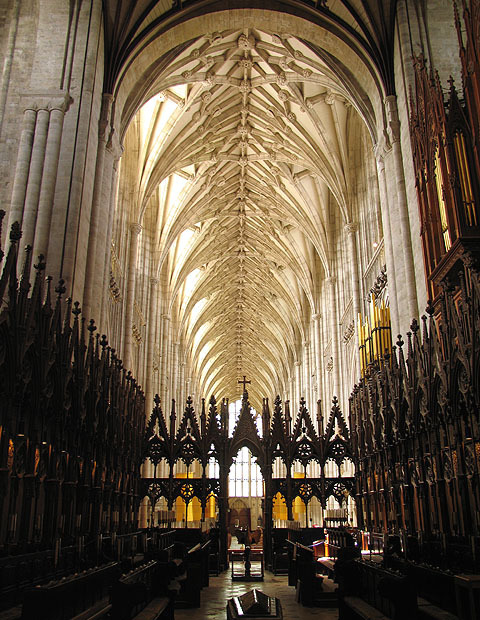 If you plan a second visit to Winchester Cathedral, do the audio tour first perhaps. Then the second time do the guided main tour, this way you will understand so much more. The famous author, Jane Austen is buried in the cathedral. She died in a house near Winchester College in 1817, she was only 41. You will find her gravestone in the floor of the north aisle of the nave. There are also two more memorials to her, a brass plaque put up by her nephew, Edward, and a memorial window. Both close by. 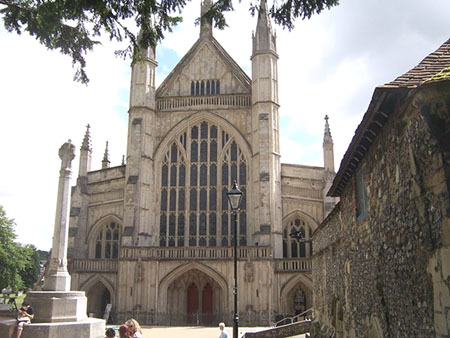 Have you heard the bells of Winchester Cathedral? A magnificent sound ringing out all over the city. There have been bells in the Cathedral since the days of the Old Minster. Nowadays there is a peal of 16 bells, the oldest of which was cast in 1621, rung by a band of around 25 keen ringers. To learn more about the bells or if you would like to join these dedicated ringers click here Quite a hobby! Even personally recommended!! However they were not the Cathedral bells, but a church tower in a village a few miles away!!! If your feet are aching, and they probably are, there is always the Cathedral shop for a welcome cuppa and a scone – jam and cream of course! The history of Winchester Cathedral deserves its own page for this very special site goes back around 2000 years. It started with a Holy Well or Sacred Spring that still exists in the Crypt. The Saxons built their Minster and the Normans built the Cathedral you see today over this well. The Cathedral is very much part of the history of England. Those ancient stone walls and the walls of the Minster before it saw great folk walk down its length. If only walls had ears!!!! There is an admission price for the Cathedral except for services instead of the old donation system. You could become a Volunteer Lots of ideas from bell ringers to being a guide, or in the shop, even help at services. Just think - lending a hand in this lovely place. 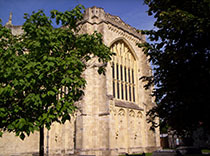 "Winchester Cathedral" was a hit song in the 1960's. Pillars of the Earth. Author Ken Follett. £6.51 Free World Wide Delivery. World Without End. Author Ken Follett. £7.61 Also available in Hardback and Audio CD. Free World Wide Delivery.